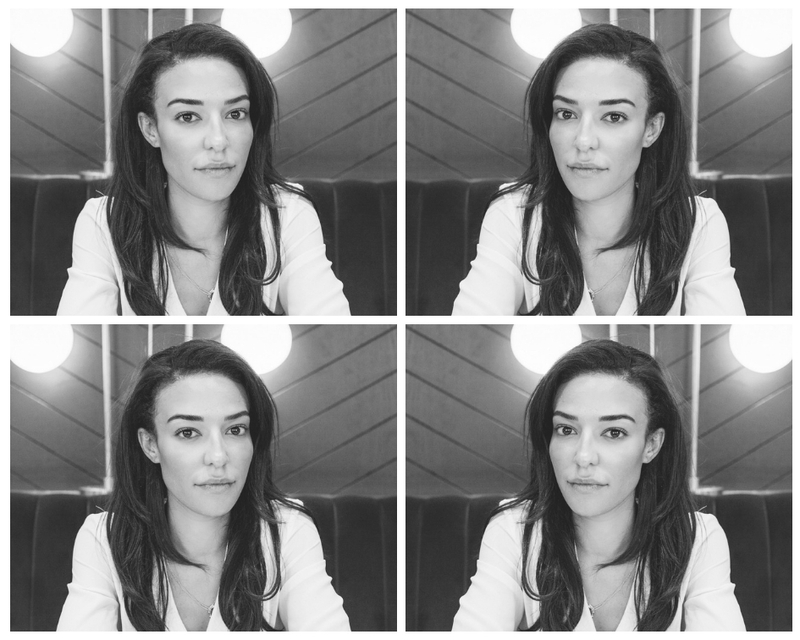 Cyran is the founder and editor-in-chief of Corporate Style Story. She loves good pyjamas, good food and good company. We’ve visited Paphos twice now, both times with Poppy in tow. The city of Paphos is on the west-coast of Cyprus and is a mix of British tourist hot spots and greek mythological heritage sites. It’s actually rumoured to be the birth place of Aphrodite, the Greek Goddess of Love. Paphos was named the European Capital of Culture for 2017 and there are plenty of reasons why. It’s a great place to visit during the October Half-Term, the temperatures are perfect at that time of year, it not as expensive as Dubai and is a perfect alternative destination for those wanting some winter sun. 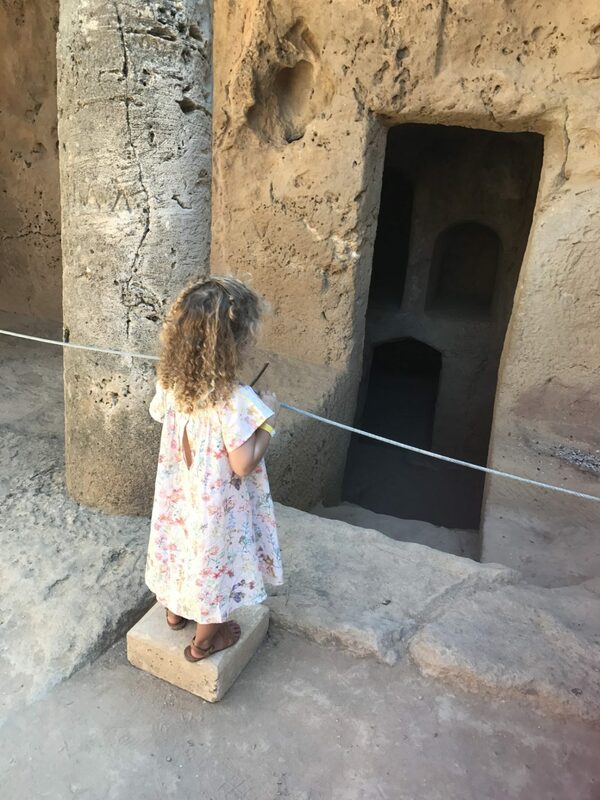 It’s a fantastic place to visit with children and as we’ve been a couple of times now, I decided to put together this Paphos City Guide to include all the things that we did in Paphos that we’d recommend. Cyprus has the longest summer in Europe, the early season starts in April and we have visited in May and October and both times the temperature has been perfect. The temperature in Paphos is between 25 – 28 degrees in October which makes it perfect for children, and with a slightly older Poppy, we discovered the holy grail that is the kids club (holiday game-changer). We were in Paphos for a friend’s wedding, (it’s a very popular destination wedding venue in Europe) which meant that we met up with friends for the whole week and and discovered some new places, so here they are. Ask any of my friends and they will tell you that the hotel I love in Paphos the most is The Almyra. Opened in 2004 as part of the Thanos Hotel Group, which also includes the nieghboring Annabelle hotel, and is easily the most chic place to stay in Paphos. 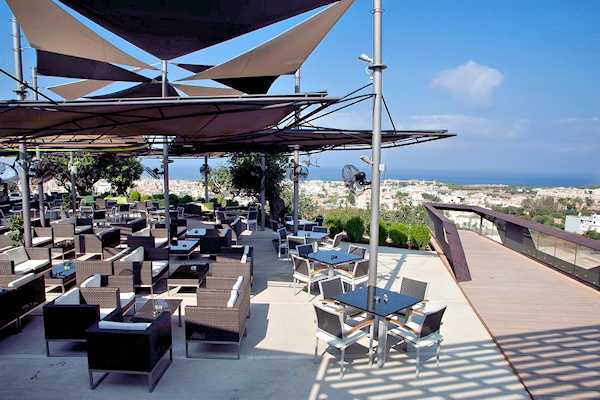 The guests are mostly Brits and many of them have children – I know a few people who always stay at this hotel when they visit Paphos and it’s easy to see why. The Almyra Hotel is sleek and sophisticated, the staff are friendly and the facilities for children are great without being overbearing. The hotel has an amazing location on the seafront. It’s only a short walk down to Paphos Harbour but far away enough not to be in the thick of it all in the evenings and makes for a more peaceful location. The Almyra is recommended by both Smith & Families (Mr & Mrs Smith) and Kuoni and the decor is modern and sleek (which is my favourite) with a charcoal, tan and white colour palette. It has an amazing adults-only infinity pool which is perfect for having time with just the grown-ups. Be warned that the standard rooms at The Almyra don’t come with a veranda or balcony, making that room a no-go for me. I also don’t think that this is highlighted enough in any of the travel agent publications. 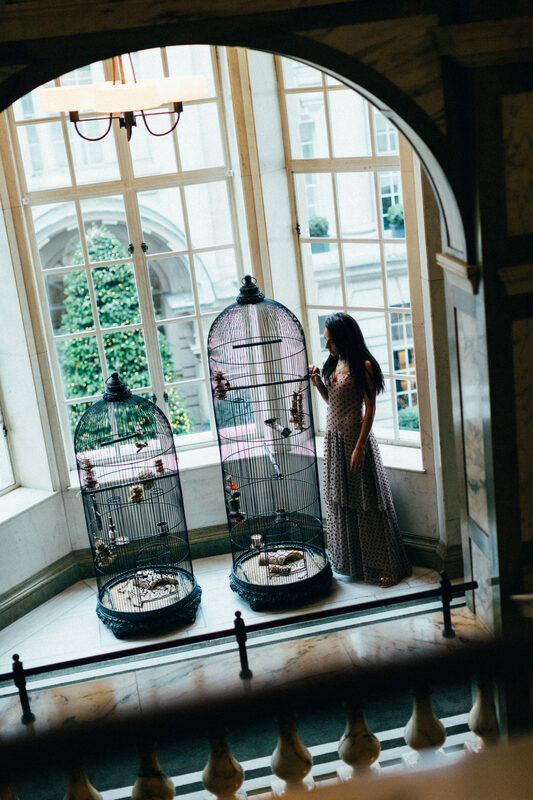 If you’re travelling as a family, I’d suggest going for a Garden Terrace – the rooms open up onto a garden that the children can play on or that you can sunbathe on. One of the things I love about travelling to warmer climates than the UK is having the balcony or veranda doors open to the room and letting a breeze come in – it’s not something we can do very often at home! 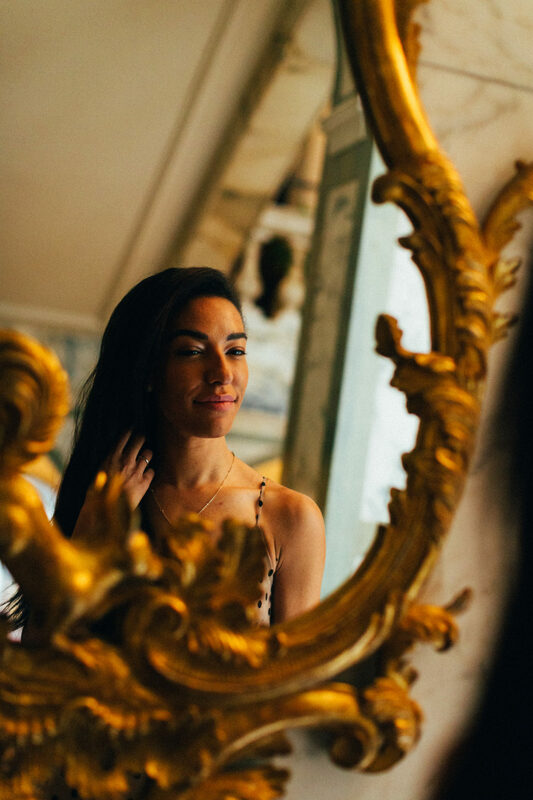 The spa at The Almyra has an amazing offering of treatments and is where I had one of the best facials I’ve ever had – the therapists attention to detail was second to none. With treatment rooms looking over the med – it was a stunning experience I won’t forget in a hurry. It’s no surprise that the spa get booked up quickly. Try the express facials if you’re short on time, you won’t be disappointed! Louis Ledra Beach this is a good 4-star all-inclusive hotel and I think one of the best hotels in Paphos of its kind for families. The pathway that runs along the seafront and connects all of the hotels on that side of the island to the main harbour runs through this hotel. Louis Ledra Beach is one of the only hotels that has good sand at the end of it. Some other hotels have rocks which means you can’t get out to the water, but this isn’t the case at Louis Ledra. The rooms are spacious and if you’re travelling as a family, a Family Room with sliding doors is the best option as it can comfortably sleep 2 adults and 2 children with the sofas turning into beds and the sliding doors separating the children sleeping area from the master bed. The Aphrodite Water Park is a 10 minute walk away which makes Louis Ledra a good option too. If you’re looking for a luxurious holiday away from the children, then I can recommend the Constantinou Bros Asimina Suites, it’s a 5 star, adults-only hotel and you can tell – the peace and quiet here was just amazing! 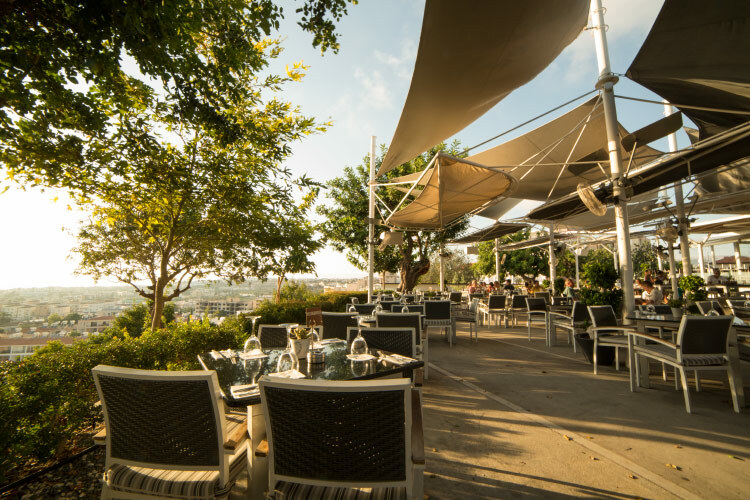 This is hands down the best restaurant in Paphos for me, you won’t find it unless someone has told you about it, as its tucked away from the harbour and up in the hills. You will need to drive or take a taxi and its about 20 minutes drive from the Paphos Harbour winding up to the top of the mountain. But the views are well worth it and it makes for an amazing photo for the ‘Gram – great drinks and great food – try to get a table at the edge of the mountain for the best views. This is a must visit for anyone wanting to experience some culture whilst on holiday. Paphos itself has Byantine Monasteries and amazing archaeological sites and The Tomb of the Kings is one of them. The Tomb of the Kings is Paphos’ most impressive site, the site contains well preserved underground burial grounds and tombs used from Hellenistic periods to Roman period from 3rd century BC to 3rd Century AD. 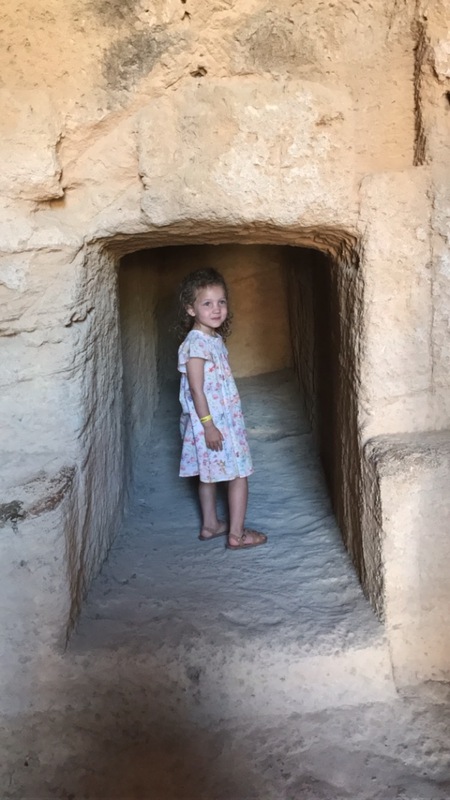 The deep dug crypts and well-preserved tombs are such a sight and Poppy thoroughly enjoyed it. Wear closed-toe shoes as it’s quite desert-like and dusty. 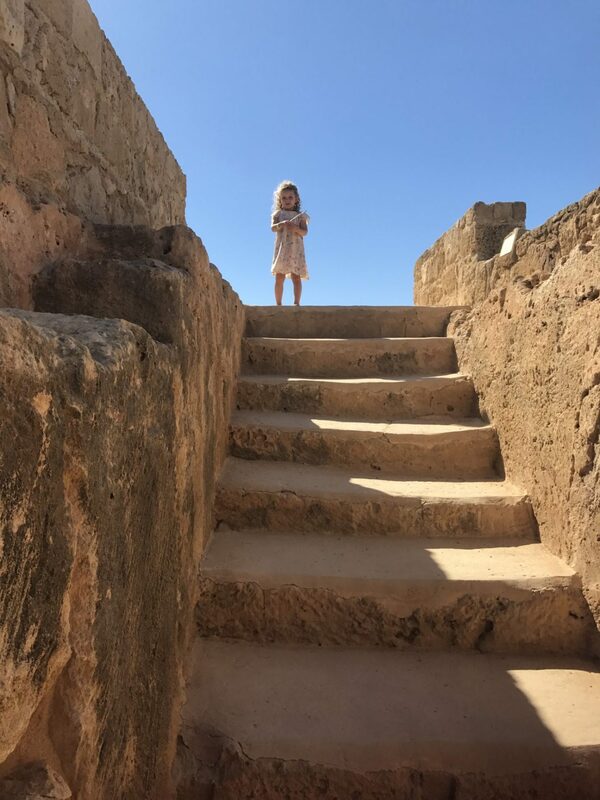 Children love exploring the site and the culture-vultures amongst you will love how different this part of Paphos is. Plus its only about 3 Euros to get in and isn’t very far away from all of the action. The name ‘Tombs of the Kings’ reflects the majestic-like appearance of the tombs themselves rather than the blue-blood of the people buried there. They are so well-kept, it really is a sight to behold. What does it mean to me, to be a successful woman in 2019? One ting I’ve learned is that firstly, success doesn’t happen overnight, secondly that it’s not a destination, its a journey and it certainly isn’t liner. This is an adaptation of an Instagram post that I typed out on the morning of International Women’s Day, but I got so many comments that I wanted to share it here too. For me, success is a moving target. I define it in different ways at different points in my life. It’s to have children and to be able to craft a career, lifestyle and interests that are fulfilling for me. A career that is full of choices, whereby if something doesn’t work for me, I either change it or I leave. Raising a little girl means that my priorities are different. I’m focussed on fulfilling my real purpose and not just climbing the corporate ladder. Having impactful and encouraging conversations with my daughter and other women – to discuss things that I haven’t before and to listen and learn from those around me; conversations that will change communities. To be able to educate myself on anything I find interesting and to understand what my passion is and to invest in what makes me happy. Understanding that education isn’t just a degree or a certificate but a real-world education including learning about myself. Choosing to live my life with conviction and doing it with a smile on my face. Being the captain of my own ship and to take responsibility for it all. I want my own brand and my own business, in an industry that is typically dominated by men and to do it really well and to hold my own. To invest in my future and my daughter’s future, to figure out what’s important to me at any given point in time and to pursue that. To being in a constant state of growth, and to foster my own spiritual development too. Knowing when I need to take time out to let my hair down, to understand when is the best time to get the work done, when is the best time to rest, when to plan for the next step and when is best to execute. To understand when I need to look after myself and being unapologetic in that. To find out what I like to spend my time doing and to do more of it. Not to compare myself to anyone, because my journey is not the same has her journey and appreciating what I have and where I am in my life. Today, I hope that more women continue their journey and define success on their own terms. You can read the original Instagram post and everyone’s comments here. Spring’s catwalk were awash with patterns for the coming Spring/Summer season and, polka dots were quite rightly, front and centre. They’re my favourite go-to pattern due to their simplicity, fun-factor and the general likability of everyone around me. I always get compliments on my outfit when I wear polka dots. Don’t you find? It’s like they put people in a good mood! One of my most-loved Instagram posts is this one of me living my best life in Paris last year for my birthday. I hadn’t even realised at the time that I was putting my looks together that this shot so closely resembled the Carrie Bradshaw moment in Paris. 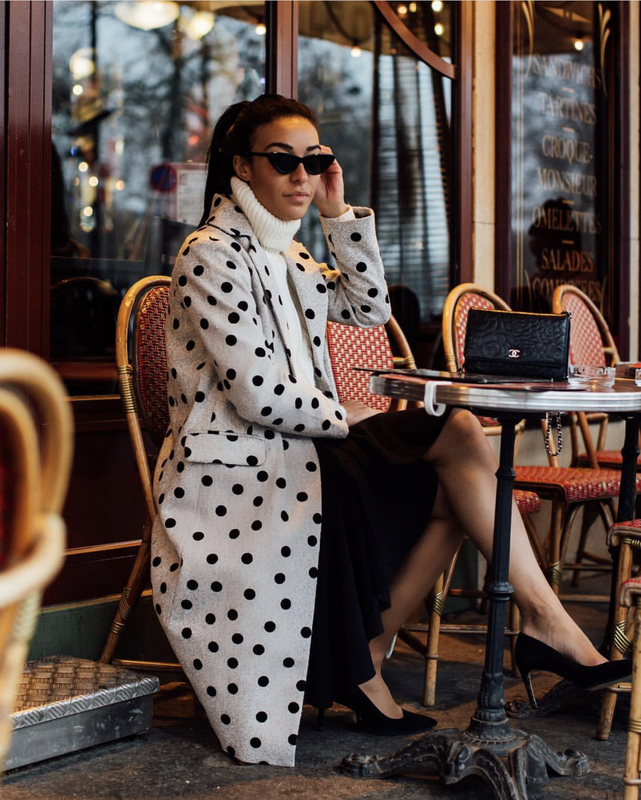 Polka dots are so distinctive and so many of you love them that I thought I’d find the best current season polka dot pieces for you, give you some tips on how to wear them for the office and let you guys do the shopping. They’re so fun and most of all this is a print that is totally wearable to work. Beware of the size of the polka dots; small dots work well if you’re wearing a dress, whereas large polka dots may be too much in a conservative environment. Take a look at this one from ASOS. Polka dot blouses can work in most office environments if the blouse/shirt is a typical shape, although this one is fab too from Moschino. I would suggest you exercise caution if you’re considering a head to two co-ord look for the office, you know if this is appropriate or not. At the moment, I think creative environments will welcome a polka dot co-ord and not many other workplaces unfortunately. I would suggest wearing one piece to a more formal office, try this affordable blazer and these polka dot, peg leg trousers from Next. Polka dot heels are also a good option for the office, but they are so rare that they’re not often seen. If you do find a good pair don’t let them get away! If you look after them you will wear them forever, they’re absolutely classic. I will keep my eyes peeled and update the post if I find any. I’ve rounded up 15 different polka dot pieces that you can add to your wardrobe this Spring, whilst not all of them are office appropriate, they will immediately give you a feel-good injection. I love them! Click on any of the images below to shop. Do you want to the latest fashion, travel and beauty pots straight into your inbox? Join the mailing list now! I don’t tend to set New Year’s resolutions really, I like to call them ‘goals’ instead which is just a psychological trick for my mind so that it doesn’t collapse at the first hurdle. Just saying ‘new year’s resolutions’, sounds like a thing designed to be forgotten before the end of January which is no good when you’ve got stuff you want to do, so I’ve settled on ‘goals’ for the moment. 2018 was a big year for me with lots going on and lots of change. I’m very pleased to report that pretty much all of it was great, challenging and quite stressful at times, but all in all it was great I learned a lot. However, towards the end of the year, December in particular, I just wanted to slow down and didn’t do very much blog-related. 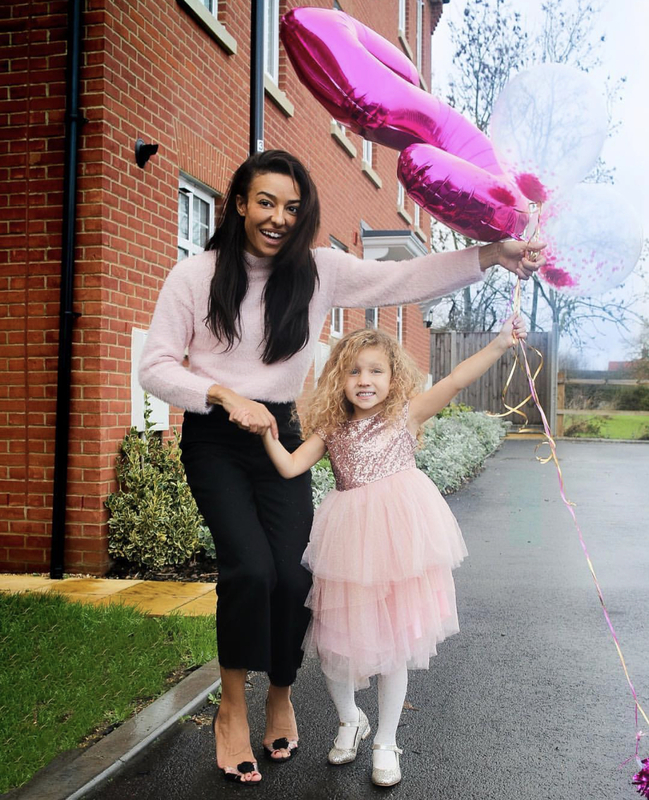 Poppy turned 5 on the 2nd of December and I felt like we’d all reached a huge milestone, so after that I took a bit of a break from the blog to plan things instead of just churning out content. I closed a big legal deal just before breaking up for Christmas so I certainly couldn’t have done anything else alongside that in any event. Of course, goals don’t have to be set in the New Year, but it is nice to have a brand new canvas to write on and decide on your direction for the year without starting part-way through the year if something not-so-great that happened. I really love a new year (my birthday is in January, so it’s a nice start to an otherwise dreary month). Consequently, I have really been looking forward to 2019, not because I wanted a clean slate, but because 2019 feels like it will be a good year. I have always set goals ever since I was in my teens, (but these tended to be random declarations of “Right, I’m doing x”). Nowadays, I write my goals down which I think is very helpful for focus and staying on track. But recently my list tends to look like a shopping list by the time I’ve finished and I often forget what I’m actually working towards. When I check back over the list, I have achieved things but the process of achieving them feels quite ‘scattergun’ and a bit too much like a tick-box exercise. Kind of “thank-you, next”. One thing that I will say is that whilst you can achieve a new goal, you may not necessarily develop any lasting new behavioural traits when you achieve your goals.For example, whilst I am good at achieving a goal, I’m also very good at discarding the behaviour and new habits that got me there once I’m there! I think that’s because, again, its the tick-box exercise. I’m ticking things off and moving on to the next thing I”m not taking much time to stop an acknowledge what I’ve done or what I’ve achieved, I’m just looking for the next thing. When I speak to my friends, they’re pretty much the same. They have this “on to the next” mentality, which is quite unfulfilling. The moral behind the Turtle and Hare story is “slow and steady wins the race”. This lesson is becoming increasingly difficult to learn because society is so used to getting everything so quickly. And usually so easily. We don’t need to study for anything because the information is at our finger tips, if we want to buy something there is usually an extremely affordable version of it we can get right now. We really don’t need to wait. So learning to develop a new behaviour or new habit? Hard work, no thanks just give me the thing. Which is why, having taken time to acknowledge everything I’ve achieved over the last year, this year my only goal is to develop consistent behaviour in the areas that I want to. Exercise – I exercise, I like doing yoga and HIIT but I don’t do wither regularly at all, I’m aiming for 2 – 3 times per week, if I could add a dance class in there I’d be over the moon, but I’m not sure I will be able to do it. Reading paper books – so I can encourage Poppy with her reading, she needs to see me reading (I listen to audiobooks at the moment). Time unplugged – to help me to concentrate so that I can focus on the things in this list! Multitasking is no good for me. Essentially, I will do more of what I am already doing in less of a sporadic fashion in the hopes of creating a more organised and relaxed lifestyle. I don’t want to be so lastminute.com anymore because I spot an opportunity to quickly fit something in. I’m using 2019 to form some new habits and I’m pleased to say that I’ve already started. I totally understand that people don’t want to be hard on themselves at this time of year, and I would recommend that before you set any goals that you acknowledge your journey from last year to where you are now. Every little thing, because it feels good to give yourself a pat on the back instead of berating yourself for not necessarily doing anything ‘huge’. Working on being consistent is my biggest challenge at the moment. I honestly haven’t been ready to change anything up until now, but I think with a new year and another birthday I’ll focus on consistency because it feels like what I should be doing. I’m not adding in anything new. All the best with your goals (or just life) in 2019, wishing you every success. I’ve always loved celebrating the 12 days of Christmas, but it appears that nowadays the build-up to Christmas is getting longer and Christmas itself is getting much shorter. Our family tradition since we were young has always been to shop the sales on Oxford Street on Boxing Day (my Dad would usually take us, while mum recovered from all the cooking on Christmas Day) and my sisters and I have managed variations on this annual shopping trip as we’ve got older. This year, I shopped online, but the approach to the sales has always been the same. Essentially, I try not to shop for clothes in the week running up to Christmas – they’ll just go in the sale a few days later and then I’ll be rather annoyed. So I avoid. I try to stick to investment pieces in the Boxing Day sale. If I’m buying high street, I ask myself, ‘if I didn’t buy it full priced, do I really want it in the sale or do I want it just because its 50% off???’. This way I hopefully won’t end up with a wardrobe full of nonsense. Sooooo…January is around the corner. Get ready to be inundated with different workout DVDs, downloadable weight-loss plans, meal-prep plans, you will be encouraged to signing up to gym memberships and lycra clad individuals will be springing up everywhere on your Instagram feed (I’ll probably be one of them, apologies in advance). I don’t suppose you need reminding that a girl can never have too many pairs of shoes. And sticking with my rules of buying investment pieces, the Boxing Day Sales is a great time to be snapping up designer shoes at a reduced price. If you’re like me and want to wear what you’ve bought now, then go for boots and strappy sandals – for New Year’s Eve celebrations of course! Shopping for things like luggage, sunglasses are a given, we tend to do this just as the weather gets warmer or before we go on holiday. But if you know you’re going, you should keep your eyes open for thins you know you will wear or take on holiday later in the year. My beloved Travel wallet from Aspinal of London, is also on sale in certain colour ways and this is such a fantastic investment piece, you’ll use it forever and its such grown up piece. You may need to hunt around for these on Boxing Day and they may also go in the sale later on in January, but the sales is the perfect time to purchase pyjamas because they are typically Winter stock that will disappear like coats and knitwear come February. You may or may not have seen on my Instagram Stories that I received a pair of Olivia von Halle pyjamas as one of my Christmas gifts from the Hubs and I am over the moon with them – I’ve wanted a pair for such a long time. These are likely to sell out before they go in the sale (my size is already sold out, I wear a size 2 fyi as I like them loose fitting). But you can check out The Outnet for reduced OvH and other designer pyjamas, but most will be added to the sale later on in January and this is the best time to buy them. If you’re like me and you have been working so much that you don’t have the majority of your gifts yet, this doesn’t mean that you have to give unthoughtful gifts on Christmas Day. I’ve sorted the best I have found that you can still order online, or take the ideas and go into the shops. You can order before 8pm on Saturday 22 December to still receive all of your Christmas gifts in time for the big day. Shop all candles on John Lewis here. My fav perfumes at the moment are Tiffany & Co Eau de Parfum I also love anything Creed or Aqua di Parma for Men and they always go down well. Mine and Poppy’s slippers that we often wear at home on Instagram Stories are from Just Sheepskin. She LOVES that our slippers are the same, they are also such a lovely Christmas gift, check out the collection here. Forgotten your Christmas Day outfit? Skincare and beauty for the well-groomed amongst your friends? A nice pair of socks for Dad?? ASOS are offering same-day delivery up until Midday Christmas Eve with Amazon Instant. Matches are offering same-day delivery within the M25 if you order before 4pm on Christmas Eve, but this is subject to availability so get in there early. I’ve been loving a new beauty brand from the Nordics called Kjaer Weiss, especially their eyeshadows, the packaging is exquisite and its nice to get something different than your usual make-up brands, check them out here. Ahhh where would I be without Amazon Prime?! It has saved me from many a disaster with its Next Day and sometimes SAME DAY delivery service. It’s where I turn to for last minute gift options. Amazon is great for electrical items and I have been using the Clarisonic Mia Smart which I absolutely love and there are different versions for different budgets. I also love ordering books on Amazon and kids books especially. Amazon will even gift wrap for you, so there really is no excuse! I also compiled great lists of coffee table books here and a further list for the stylish man in your life here. More and more people are converting to listening to audiobooks and so an Audible Membership is a great option and you can literally just buy it online, no delivery required. I get the 2 books per month membership because I aim to read 24 books a year. Do not underestimate the value of a fully charged power bank ready to give your loved ones’ phones a much needed boost when they are out and about Storying over Christmas. Check out Amazon’s collection here. I have seen Youtubers make their hair look amazing creating big beachy waves using the Dyson Airwrap. And of course, Christmas is the perfect time to gift an electric toothbrush! I got mine for Christmas last year and use the Sonicare Healthy White+ toothbrush. If I didn’t include pyjamas in this, I would be tossing and turning night. I’ve pulled out some of my favs that will be available in time for Christmas this year. Winser London’s new silk pyjamas are absolutely exquisite and are easily the most luxurious set I own, you can check them out here. Net-a-porter has a great collection that includes, Olivia Von Halle, Asceno and Eberjey and these are really special. Debenhams do a fantastic collection of pyjamas and you can do a Click and Collect order before 9pm on Saturday 22nd December. Champagne is special enough to be a great gift and you can bet your bottom dollar it will be very appreciated and will most certainly be drunk over Christmas and New Year. You can pick these up in the supermarket, do a click and collect or you can even buy them in the garage on the way over to the in-laws on Christmas Day if you must! To make it extra special, opt for a personalised bottle of Veuve Clicquot, which you can order up until Sunday 24th December from Selfridges in London, Manchester or Birmingham to collect on Christmas Eve. National Gallery – for the discerning art lover, the National Gallery membership includes private views of exhibitions before they open to the public and exclusive Members’ events including concerts, cinema screenings, talks, and more. British Library – Free entry for you and a guest to British Library exhibitions. Exclusive access for you and a guest to the daytime Members’ Room, overlooking the King’s Library. Entry for you and three guests to the Knowledge Centre Bar, and priority booking on events and up to 4 free event tickets per year. This is a lovely membership for the history lover out there. Sea Life Centre – with centres all over the UK, the Sealife Centre is a really fun place to visit if you have children, so a family membership is a good choice to include everyone. Included is a free theme park ticket per pass (choose from Alton Towers Resort, Chessington World of Adventures Resort, LEGOLAND® Windsor Resort or Thorpe Park Resort) and additional discounts. ZSL London Zoo – we have this membership as a family and it is worth its weight in gold. It includes membership to both London and Whipsnade Zoo and Whipsnade Zoo is a great place to take their scooter as its so big. You get fast-track entry and other discounts and free parking at London midweek. 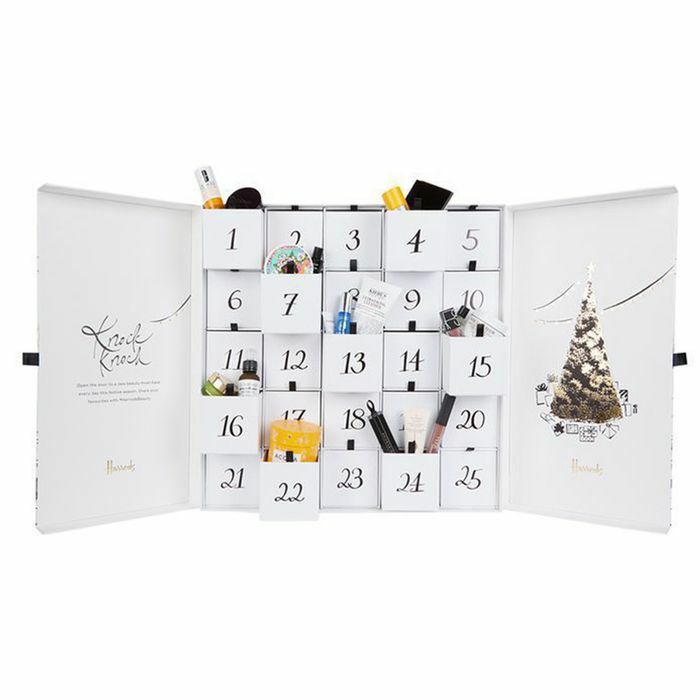 Who doesn’t love a luxe gift with more than one use? 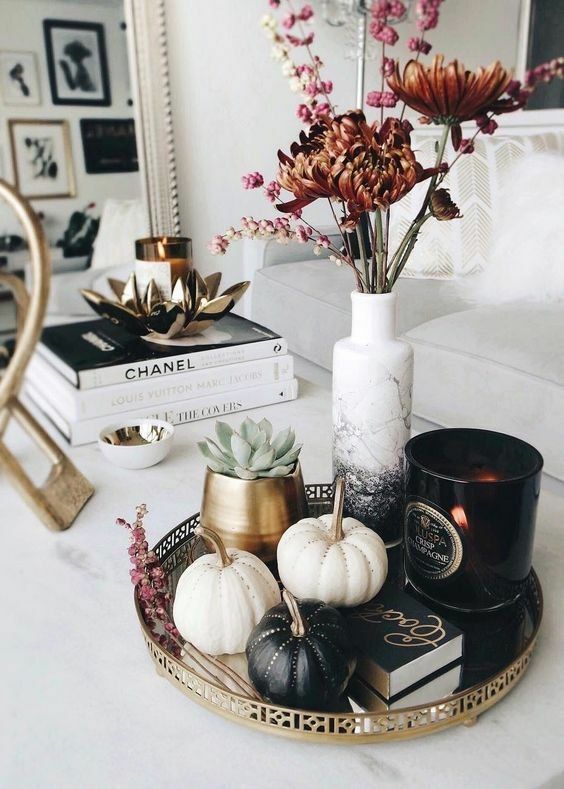 A beautiful coffee table book is a great decorative item for the home and they are always well recieved if you choose the right topic, and there are plenty of coffee table books to choose from out there. I have colated the most up to date collection of beautiful coffee table books for you below. There is a coffee table book for every stylish woman and they range in price from £20 to about £60 so they fit most budgets too. Check out our coffee table book list curated with men in mind. There are coffee table books dedicated to curating your perfect coffee table. The stuff on your coffee table says a lot about you and your coffee table books are a huge part of that. I see them more as decorative pieces that lets guests to your home learn about what kind of person you are with a quick glance at the titles. Coffee table books are as decorative as they are practical and make great gifts. Ideally, coffee table books should be hardback, with large titles, great photography and be stacked from big to small and piled 3 – 5 books high. do read them! It’s like your guests will ask you about them and will leaf through themselves, so it would be good to show them section or images you actually like! Keep them clean, they can get dusty if they’re not touched/read often, so wipe them down with a damp cloth every few days. I have been shopping Black Friday since before it arrived in the UK back in 2009 and has been going since the 1940s in the US. Amazon introduced us to Black Friday deals back in 2010 and since then the UK market has been gathering momentum offering us deals on so many things that it’s hard to resist. I have been shopping Black Friday since one of my best friends, who runs The Candy Company, told me that she was flying to New York for the weekend to shop Black Friday sales. I soon copied her by flying the following year myself and the rest is history. You hopefully make more responsible buying decisions. You don’t get sucked in to the hype of Black Friday and just panic buy things because they are on sale. You know the best times that you should buy the things you want so that you get the best deal. New style furniture is typically released in January and February as people redo their homes in the New Year with renewed enthusiasm (we all have bucketloads of enthusiasm in January, right?!). So it’s advisable to wait until then. Typically in the UK, Boxing Day sales were the time to buy furniture as furniture shops were the only stores open (remember that?!) However, you will still be buying old stock even if you buy on Boxing Day. 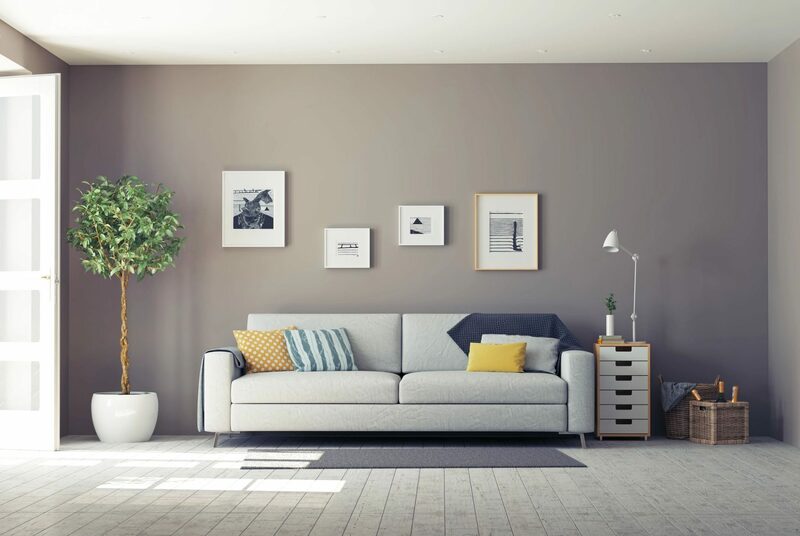 If you want to shop new trends and new pieces and hopefully keep that furniture for longer, then you’re advised to wait until January and February when new style are released and you can be one of the first with it for a great price. I mean. Fitness Equipment on Black Friday. Whilst of course there are more enticing things to spend your money on during Black Friday, I can totally see the appeal. Not wanting to subscribe to the cliche that is ‘getting fit in January’, you may be encouraged to get a head start or even buy something as a gift for Christmas, but again, January is the time to buy fitness equipment for obvious reasons. Sales of workout gear and fitness equipment and fitness DVDs increases exponentially, you’ll only need to look out for advertising and online content immediately after Christmas to get the idea. The best deals are to be had in January for fitness equipment, unless of course you’re buying it as a Christmas gift for the health conscious person in your life! This goes without saying. I know plenty of people who buy Christmas decorations after Christmas because they go on massive sale. It’s the best time to buy decorations of course. So it’s best to wait until then. However, if you need Christmas decorations then you can find some good deals on Black Friday, the deals just won’t be as good as after Christmas. Yes you will get good deals, but the best time to wait for children’s toys is the first couple of weeks in December. Also remember that toy retailers deliberately do not release enough stock of popular toys in the run up to Christmas so that they create a shortage and delay some of their sales for January. So if you’re after a cult-toy this Christmas then go for it on Black Friday. If you’d rather not have a disappointed child instead of saving money, then throw caution to the wind and just buy it now. But if you’re after the best deal, do wait if you can. Also children will get so many things, that you can include a note from Santa to say that the toy its on its way and get it in January. Some people probably can’t believe I’m saying this as a fashion blogger, but I would suggest you avoid buying Winter clothes on Black Friday. Yes, there are great deals to be had on clothes, and if you are going to shop the Black Friday sales I’d suggest that you buy Christmas outfits and sparkly party outfits and things you’ve wanted for a while that are on sale on Black Friday. If you’re just looking for something that takes your eye, then you’re advised to wait until January when the real sales start on clothes. Retailers will get their new clothing collections in in February (yes, Spring/Summer ’19 will start in February. Ugh!) so they will be getting rid of everything Autumn/Winter in January. So wait if you can. But get good deals on party dresses and investment pieces for your wardrobe on Black Friday. The jury is out on this one. The reason why experts advise avoiding Jewellery on Black Friday is that typically deals on jewellery deals have usually be reserved for Valentines Day (of course) and Mothers Day (yessssssssss!). However, more and more jewellery brands are giving us Black Friday discounts, so I don’t think you necessarily need to avoid spending on jewellery on Black Friday if there isn’t a more appropriate gift for someone, or yourself of course! 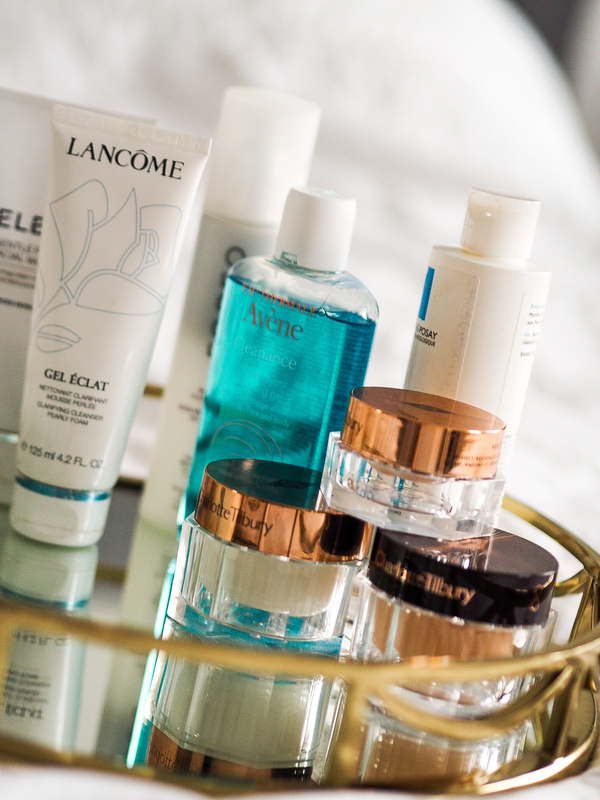 The best deals to be had on beauty is on gift boxes. Hands down. 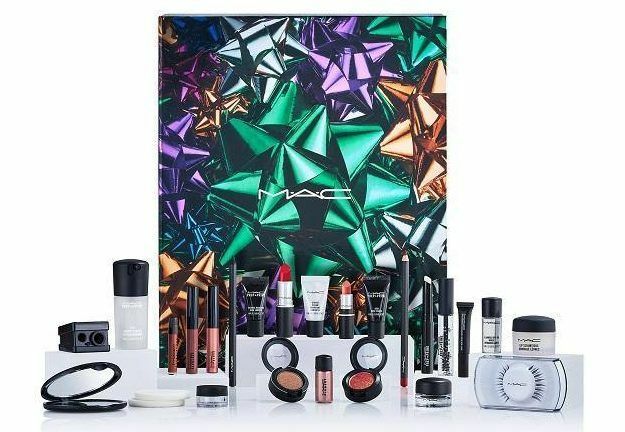 Usually Black Friday deals exclude gift sets. That being said if you can find Black Friday deals that allow you to spend on beauty then you’re good to spend. Another great deal is if you can find a ‘gift card with purchase’ deal which means you can buy gifts on Black Friday and treat yourself in the January Sales. Stick to gift sets and you’re golden. I’ll admit, I’m that person that often offers up weird and wonderful software and apps to colleagues and friends that I’ve heard of if they’re asking. As far as I’m concerned, more often than not there will be technology that can help us manage day-to-day life better if we just know what’s out there and try it. As I work in the technology industry, I really enjoy checking out new software to see how I can improve what I’m doing, be more organised or more creative, so here is a list of the apps I can’t live without and those which I use on pretty much a daily basis. Some you’ll have heard of an others you may not have. Enjoy! P.S. I haven’t included social media apps, because that’s just a given! As the saying goes, “an elephant never forgets” and Evernote is top of the list of 7 apps that I can’t live without. Think of this app as your external brain. I’m a huge list-making fan so I really like how customisable the list-making functionality is in this app, although it’s not solely used for making lists. You can copy and paste parts of websites to go alongside your text, add photos, squiggle in a list or project – anything you want to make your notes come to life for you. I have the Evernote app on my phone, I use the web version on my Mac and I have the Evernote shortcut on my bookmark bar and they are all synced which I love. I use Evernote throughout the day, its the default app I use to take notes on anything, I love how customisable it is without being our complicated. My external brain indeed. ii. plus, as a new mum who has the time to sit down and read?! But being a new mum didn’t mean that I stopped reading, I have been avid reader my entire life and since having Poppy, it just meant that I needed to find a different way to consume books. Audible is it. Nowadays, I usually read about 20 books a year and the majority of them are non-fiction – you can take a look at my top 10 books here: Books I Love . Audible is my favourite way of consuming books that otherwise you wouldn’t have time to read. I listen whilst on the tube, driving, cooking dinner, tidying up and when exercising. Audible works with Alexa too so you can play through the Echo devices too – which is GREAT – “Alexa, play my book on Audible”, and it will pick up where you left off on your phone, I love it. Audiobooks are a brilliant way to use otherwise ‘dead’ time and everyone from Tim Ferris to Holly Willoughby use Audible. If you’ve haven’t tried it yet, you can choose a book of your choice for free, below and the membership options start from £7.99 per month. I get the 2 books per month plan (which is £14.99) and you can roll over any unused credits. Who really likes having a purse full of receipts?? I definitely do not. It doesn’t help that I can’t ever find the receipt I need because there are usually so many to keep track of, and if you don’t have a system you’re bound to lose them if they’re just scrunched up at the bottom of your bag. Expensify means that I can take a photo of the receipt and store it in the app so that I can attach it to an email and send it to whomever needs a copy of it – the finance department, my accountant, or even HMRC (hopefully not!). You can also create reports and the Expensify app also has other expense management tools. The basic plan is free and does exactly what I need it to and I’m confident that my documents are all stored in it safely, but to be on the safe side, I download the PDF each month with the information and send it to my accountant. Its clearly another app I can’t live without. Spritzlet is a speed reading app that helps you to ‘spritz’ the internet. This is how I read long-form blog posts, usually think pieces without many photos – Sprizlet really will change how you consume information online, especially is you read a lot of blogs or long-form content on the screen. Download Spritzlet to your bookmarks bar and when you go to an article or a piece of content you want to read, click the Spritzlet app. The Spritz widget will pop up with the full text and you can read it however fast you choose, between 250 – 1000wpm. The red letter is intended to help your brain to actually ‘comprehend’ what its reading instead of just consuming individual words. I’m not sure of the science, but it works. Time recording. Possibly the bane of most lawyers’ lives or anyone else that works on a time-basis for that matter. I haven’t had to record my time for a long time, and in all honesty recording time was one of the many reasons I moved away from working in private practice so early on in my career. However, now as a freelancer I think its good-practice to understand where the bulk of my time is spent and to record my time for my clients’ peace of mind. An unexpected benefit of using Toggl is that, funnily enough it makes me more productive. I’m aware of the clock and what I do and don’t want to charge my clients for. I want to spend my time doing valuable work and toggle makes me more aware of that. Toggl has free and paid-for options, I currently use the free version which works well enough for me and it’s definitely one of the apps I can’t live without. Now when I tell you that an app has got me out of more situations than I care to remember, it’s Waze. I hate traffic, can’t stand traffic and would rather drive around the ‘back-doubles’ than sit in traffic. Was works by tracking other drivers’ journeys once they’re logged into the app and presents to you a journey planner that takes into consideration what is happening on the road, including how fast other road users are travelling and therefore detecting traffic, if there has been an accident etc – its fabulous. Users can also report what is happening on the roads, such as car accidents, road works, even police sightings and speed cameras. It’s the Facebook of sat-nav! Super easy to use too and you can store home, work and favourite journeys. Last but by no means least, love it or hate it the last app on this list has got to be Uber. Uber is available across Europe and of course the US. It has got me to the airport on time when other transfers have let me down. Uber has got me across the City when there are no black cabs to be found and its pouring down with rain or my shoes are killing me (come on we’ve all been there, right?!) and Uber has got me safely home after a rather late night out on the town with friends. It even helped us on the school run when the car had a flat tyre one morning. Poppy now considers Uber a normal method of transport – “I think that’s our Uber Mama”, *points to random Prius in the road*. She does make me laugh. Knowing how much your journey is going to cost you before you get in your cab is a bonus, as is sharing your ETA and location with someone you know if you’re travelling on your own. I haven’t used the ‘Uber Pool’ feature and I’m not sure if I would. Find out how to share your location in an Uber here. It’s not without its issues sometimes, but in terms of contingency planning and for ease of not needing to travel with cash or even a card – Uber is perfect, it’s definitely an app I can’t live without. Even if you prefer getting a black cab, public transport, for contingency purposes Uber is a must-have app on your phone. It also helps that I can use it in most countries when I travel too, oh and lots of Uber drivers use Waze – win:win. 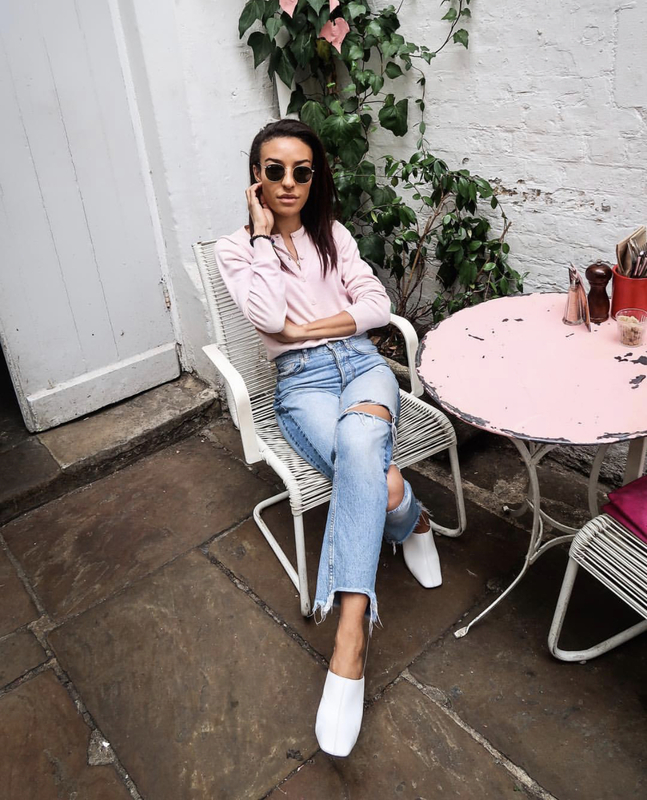 There are so many fashion bloggers out there, who wants to see another one? If I can even call myself a fashion blogger…. Why am I going so niche, who really cares about what they wear to work? Ok, say there are a handful of people that do care about work wear, they are probably already following the super established work wear bloggers, why would they follow me? I’m not a writer, my blog posts will be awful. Ok… so imagine a handful of people read my blog, what if they don’t like what I have to say? Do I really want to put pictures of myself on the INTERNET?! I have a demanding job, a young child and a husband, do I have time to blog? Ok…. let’s say I put some photos out there, I manage to find some people who care about what they wear to work, they decide to follow me and read the blog; I enjoy writing and I’m happy with my style; I create content people may actually like….after all of that – blogging is really hard work, will I just throw the towel in after a while? Which probably means that I shouldn’t even start…. Since I started CorporateStyleStory.com back in 2016, it’s certainly been a roller coaster of a journey; I’ve learned so much, I’ve created content people really loved, I’ve met so many amazing people and had some great experiences but it hasn’t been without it’s challenges, times when I’ve struggled to motivate myself and steep learning curves. Lot’s of people have asked me what made me start my blog – Is it my hobby? Is it for professional reasons? Is it just for fun that has now turned into something? Do you want to be a “full-time blogger” and quit law? So Why Start a Blog, Cyran? To rewind slightly, the brief history is that I started my first blog when Poppy was a year old, it was 2014 and I’d returned to work full time, so I couldn’t attend baby groups and NCT coffee mornings like I used to (and I really loved my maternity leave, Poppy and I got up to so much). I loved that time besides being a new mum, to chat to other mums, socialise, share experiences and feel like a normal person. When I returned to work, I knew I wanted to do something that was “all mine” besides work and toddler schedules and household stuff. I’ll call that first blog a “parenting” blog, but I really didn’t feel inspired to create ‘parenting’ content, I didn’t feel comfortable posting content of Poppy back then and I didn’t want to share her milestones. I was juggling work and motherhood and to write about it back then was too much. I was more interested in connecting with other mums in the evenings and unwinding a bit. It worked, I made lots of online mummy friends whom I still speak to today and they are now successful bloggers because they kept going. They are social media aficionados that I can ask questions of, brilliant writers and business women. They support me and I support them, nearly 4 years later and having not met IRL (yet). Being a “mummy blogger” at that time kept me sane when motherhood was making me feel isolated – I’d moved from South London to North of the river (which is almost like moving to a different place entirely) and my South London friends were obviously no longer local. Blogging, catching up with other mums during Twitter chats and reading their posts, commenting plus adjusting to life as a working mother came together for me because I had an online community I could tap into whenever I needed to. I also realised at that time that blogging about being a mother really wasn’t something I wanted to do in my spare time. So I stopped. I focussed on my career. I always knew I’d return though. Fast forward to 2016 and I’d reached where I wanted to career-wise, I’d worked hard, I’d advised the business through lots of change and big strategic deals, I’d learned lots, I’d been recognised for doing a good job and I’d been promoted. At the same time, I’d decided that I wanted to help the next generation of young professionals coming through the ranks and to pay it forward the way the more seasoned lawyers I’d looked up to as a student had with me. I knew I didn’t really want to talk to students about the academic stuff – there were much better placed lawyers to help them with that – I wanted to help them with the soft-skills; the stuff nobody openly talked about, but was still an incredibly important component of success. If I was going to give up my (very limited time) I time wanted it to be enjoyable for all involved and not too serious if I could help it. I also want to share my passion for dressing well for work or business with other women regardless of where they were in their careers or which career they had chosen. So I set myself some new goals. What is a Work Wear Blogger, anyway? I’d struggled to find “work wear” bloggers when I was returning to work after having Poppy – judging by the fact that fashion bloggers at that time only dressed in outfits that were appropriate for the weekend, suggested to me that their audience and readers were clearly more concerned with how they looked when work was over. 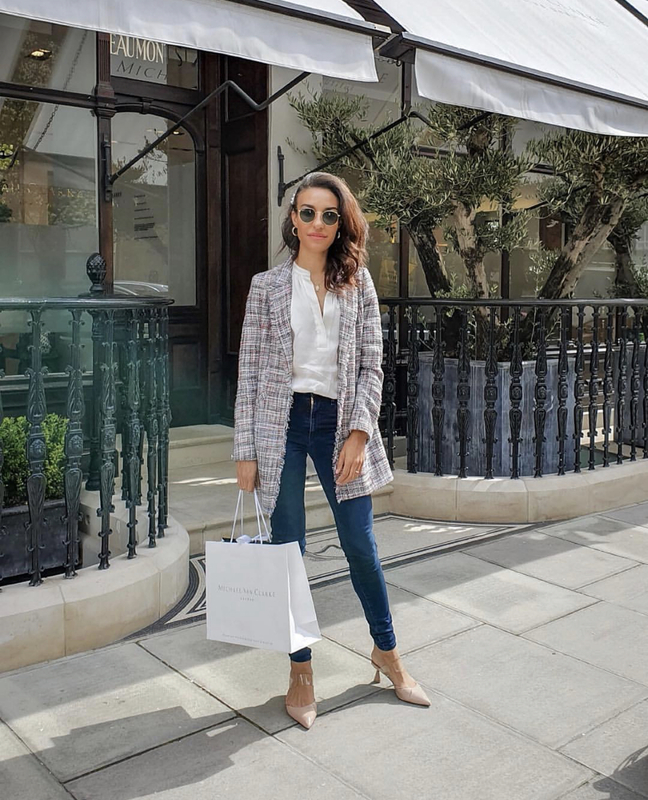 Nevertheless, I thought that there MUST be other women who, like me, wanted outfit inspiration on how to dress for work and a place where the dos and don’ts were collated and so I decided I would start a fashion and lifestyle blog about, well, how to dress for work and the corporate world. CorporateStyleStory.com was born in late Summer of 2016. 1. You need GOOD photos (that neither me nor Hubs knew how to take). So anyway, with all of these scary, self-imposed obstacles, I have managed to build and start my blog, grow my readership to tens of thousands of people, gain a social media following of about 20k, work with some great brands, meet amazing people and also be a Finalist in the Brilliance in Blogging Awards by Britmums twice in two years. I have continued to work full time and spend quality time with my family. I Google everything pretty much. When we search for something on Google, the search results that come up have been created on a blog or website. Google decides how high up in the search results that post comes up based on a number of things. If nobody had blogs or created content, how would we all get the answers to those very important-but-oh-so-very-random questions? The internet is designed to encourage us all to create content and to share it. That is what the World Wide Web is made up of – other peoples’ content. I want to share my personal style and curated work wear pieces with as many people as possible, the idea is to make women’s lives easier – not sure what to wear to work? 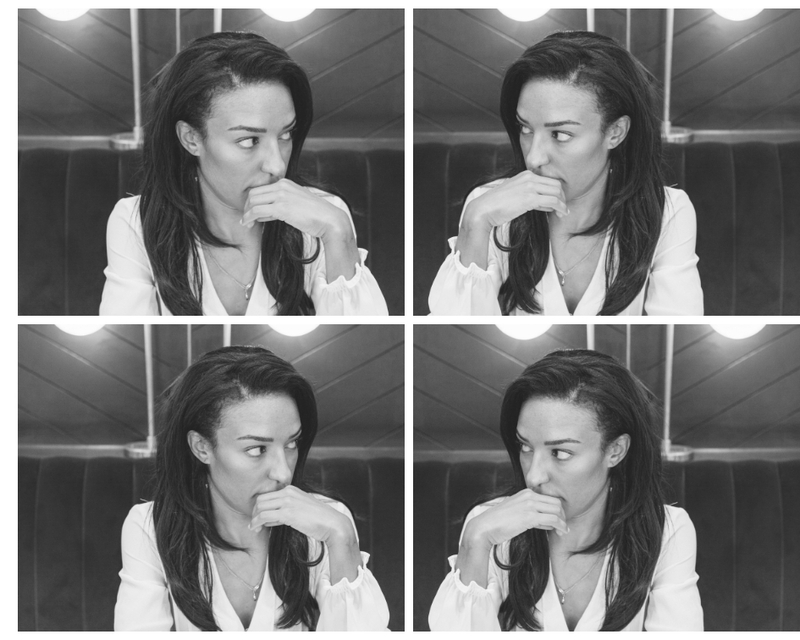 Have a look at my Instagram feed, get some ideas put your outfits together – done. Read a blog post and shop what’s on there. I’m creating content that I wanted but couldn’t find. This is why I share and support other bloggers in my niche. We’re all trying to do the same thing hopefully, so why not? There are many reasons why people have hobbies outside of work or education, they want some RnR, they want to get fit, they want to exercise creativity. 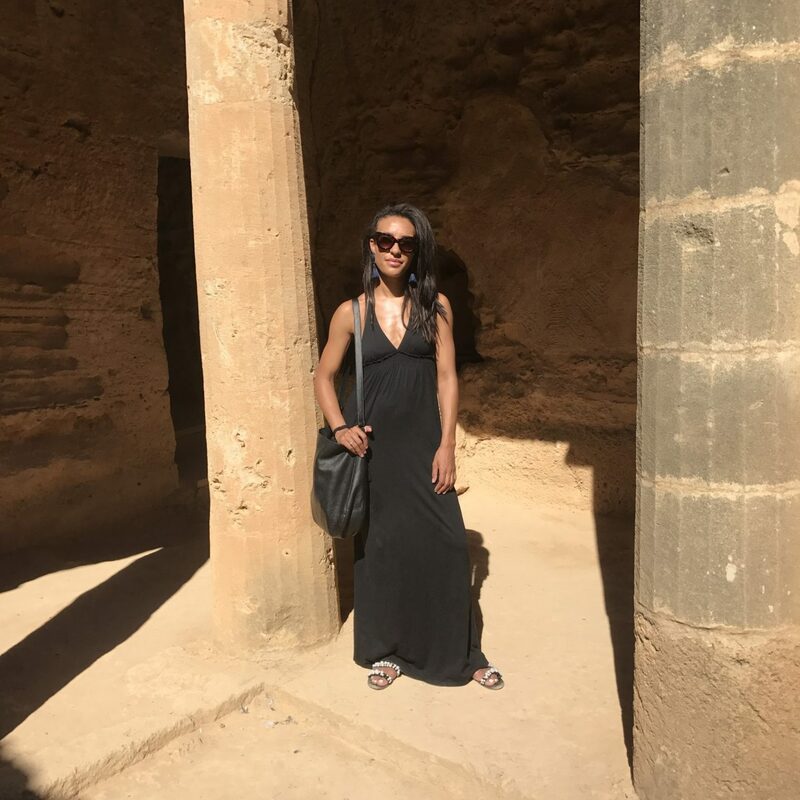 I blog because secretly I’ve always wanted to be a “creative”, I toyed with the idea of going into fashion before deciding on law. In all honesty, it was an easier career choice to explain to my family and I know lots of people will understand that. I decided to go into one of the traditional “professions” when I embarked on my career and my university choices. 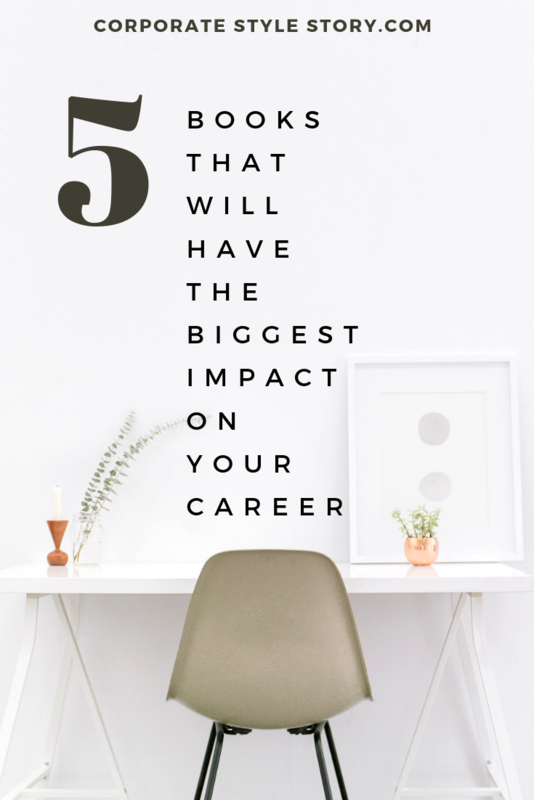 At that time, choosing to be a doctor, banker or lawyer; these were all reputable careers and what most of my peers at university now do as their day job. I am proud to be a lawyer. Although when I blog, I feel like I use a totally different part of my brain than when I am working day-to-day for my clients on legal matters. I didn’t know the fashion world at all and my academic studies had been preparing me for an academic career so that’s the direction I naturally went in. I didn’t have a burning passion for fashion, I had a healthy interest in it which wasn’t enough for me to go to art school. I don’t regret my decision, I love my job and I’m good at it. Now I get to do both. My blog is a representation of what I want to write about, what my readers have asked for and is related to me and what I want to say. However, the skills required to blog are insane, whether thats to get a post in front of one thousand people, or to even get a particular post to come up on the first three pages of Google -it’s an incredible amount of time and effort and knowledge. There is a science to it and it’s an entire career path in and of itself. But I try to do everything required for my blog because I enjoy it. I like SEO, I like taking photos, I like visualising what the content should look like when its finished and its a creative release for me. I talk to my readers and followers about what content they want to see and then I get creative about how the content will capture their attention. It’s fun. When people say that social media is ‘toxic’ or that it creates the ‘comparison trap’, I have to say that that hasn’t been my experience, but then I didn’t grow up with social media. I hadn’t used social media for personal use much before I started my blog; I didn’t even have a Facebook account! I do understand however, that with the explosion of social media influencers online and their perfectly curated feeds the impact (whether positive or negative) that this has on our own lives. For me, any negativity I’ve heard about is outweighed by the amazing people I have met online and subsequently in real life. They are real people, with real lives and challenges and when you make a connection with people they do tend to share that. Finding people that support you and cheer you on when they haven’t met you is incredible. That’s when there is an opportunity to help each other and learn from each other and make genuine relationships that transcend the ‘toxic’ social media. I see Instagram especially as a ‘business card’ – a show reel – people whip it out and hope you’re impressed. the numbers, the images, the aesthetics. People are deliberately sharing what looks good to get our attention so that we can appreciate those things and hopefully enjoy them. Behind those pretty images are usually real stories that motivate or resonate with us. Even if they are superficial with no real depth, I can appreciate the time taken to put the outfit on, do the make-up and strike a pose. I like the effort. I’ve been fortunate enough to make real friendships on social media. I met Mel, from www.polished-professionals.com and since then we’ve met in London a few times, created a chart-topping podcast together and she has given me such amazing career advice that I don’t know where I’d be without her. We met on Instagram. The bottom line is that I don’t compare my actual life to any bloggers’ on Instagram because it is indeed the show reel. It’s like any shiny thing in the window. Do not think it’s real life and instead connect with the person in the image or video and see how much you have in common. Use social media to be sociable! I majorly underestimated the technical, strategic and organisational skills required in order to create a blog that people want to read and to grow it. I knew from that first blog that it wasn’t as easy as just writing on a page and hoping that people stumble across it, love it and share it with all of their friends. I think I have read at least 6 books about blogging in the last 2 years and listened to countless podcasts and read lots of online content to understand the blogging world. And that’s just about blogging. That doesn’t include learning how to understand (simple) code, how to use a DSLR (still learning , how to edit photos, how to record and edit a podcast and video content and even how to use the 4 social media platforms I use regularly. The learning curve has been steep and there is so much more I want to learn. Social media changes regularly as do trends in blogging and how search engines work – but it’s all a process so I make sure that I continue learning so that I can adapt to the changes. I do this because I enjoy it. This is a huge undertaking if you aren’t blogging because you love it. I remember seeing the ‘big’ bloggers back when I started my first blog and hearing about The BiBs and I was soooo impressed by their blogs that I followed them and asked them for advice. I wanted to win a Brilliance in Blogging Award one day. This year is the second consecutive year of being a Finalist in the BiB Awards and I am blown away. I’d love to win this year. 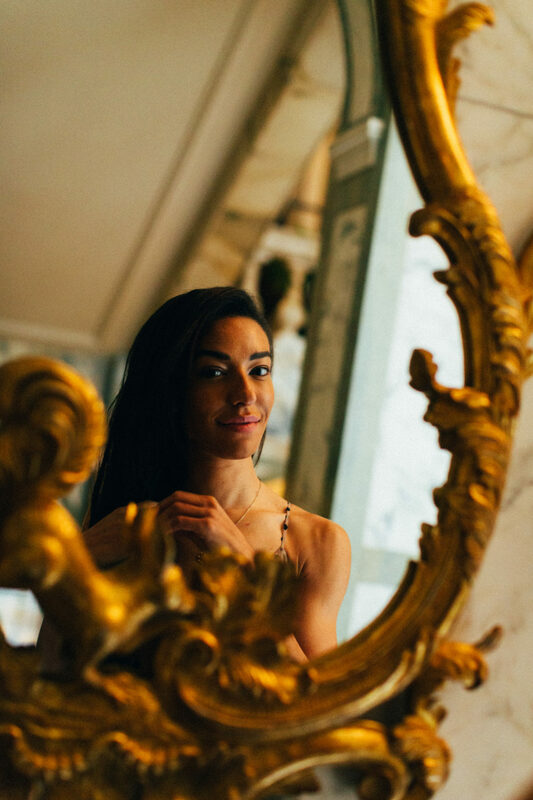 Since I started working after becoming a mother, I wanted to highlight the niche that really represented me; a professional woman who is serious about her career and who really takes pride in her appearance and enjoys perfecting her corporate style. A woman that, of her own volition, has returned to the workplace after having children. A woman that still wants to be successful in business and be a good mother. I’d like to think that I’m sharing work wear style alongside my journey as a working mother and hopefully I’m doing it justice. So many of you have said that you’ve voted for me and wished me luck and I am so grateful for your support. I often feel like I have thousands friends that share the LOLs and the stress and challenges when I post what is going in my life online. Friends that respond to my Instagram Stories and who participate in polls (even if you guys are undecided on kitten heels haha!) Friends that respond to my random musings on Twitter and send me emails asking questions and say how much you enjoy my blog. I’m beyond flattered that you seek my opinion. I’m grateful for the opportunities, lessons and connections blogging has brought me and I think that everyone should be able to experience it if its something you’re interested in. If you’ve ever wanted to start a blog and write about what you’re passionate about or interested in you should. If you’ve wanted to engage in conversations with other like-minded people, now is definitely the time to do it. Don’t wait until you have all the skills and the equipment and until everything is “just-so”, just do it now and learn as you go. You’ll be glad you did. Let me know when you’ve started your blog, I’d love to see how its going. If you’re interested in learning how to start a blog, let me know in the comments and I will create some blog posts around that, otherwise just get to it! Thanks for reading and following guys, I really appreciate it. Honestly. 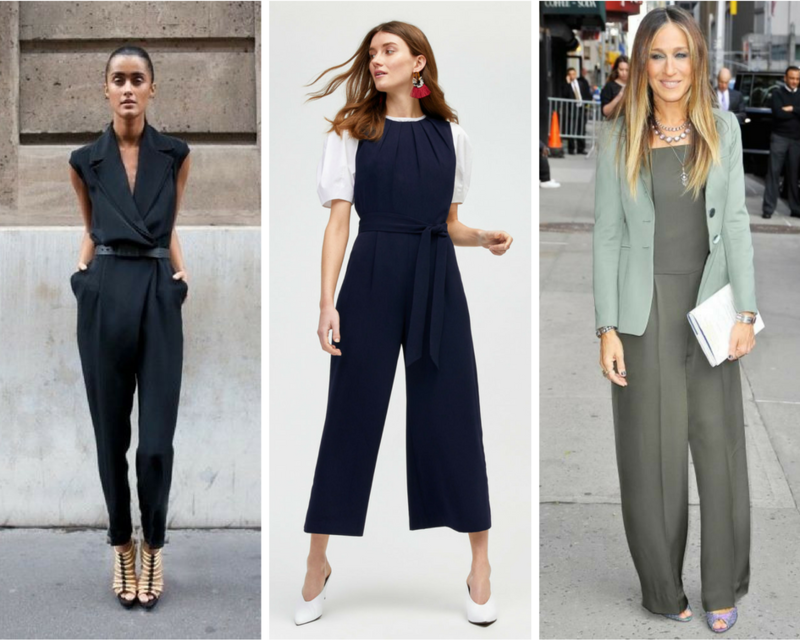 How to wear a jumpsuit to work? That is the question. 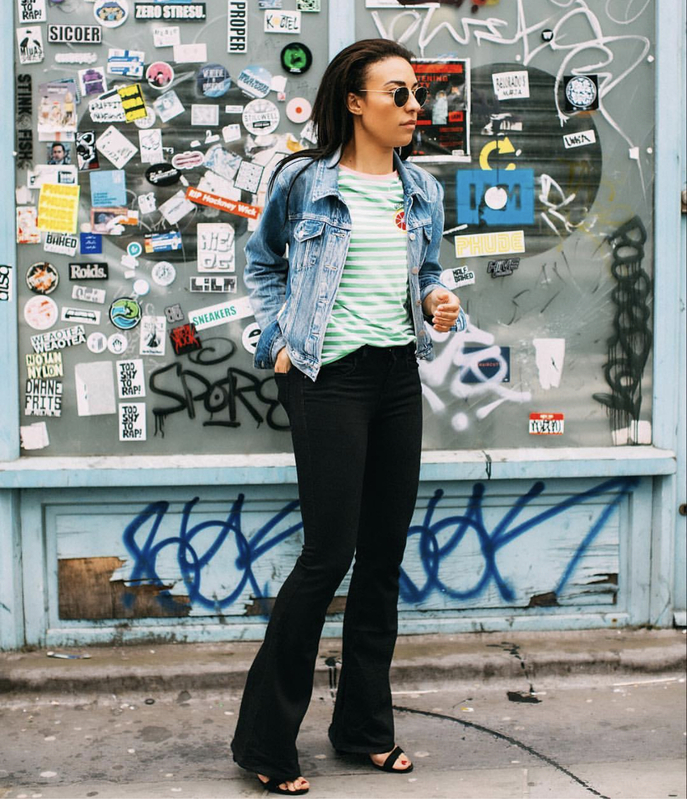 If you’re a fan of trousers, then wearing black or navy trousers to the office can quickly feel like Groundhog Day – there’s only so many times you can put a different spin on this outfit without it getting boring, really quickly. This is where the jumpsuit comes in. Infinitely versatile, you literally just throw it on, pick up your bag and go. Perfect for the office and then after work drinks, the jumpsuit can be a real life-saver in the navigating-the-workwear-dress-code-restrictions. When it comes to knowing how to wear a jumpsuit to work, in formal environments it makes sense to go for solid colours in either black, navy or white. Summer may allow seasonal colours and possibly prints (which I’ll come on to later), but the safer choice in a formal environment would be to keep your jumpsuit to these colours for work. If you’ve followed me on social media for any length of time, you’ll know that I love polka dots – they’re so fun, and can be very flattering so a polka dot jumpsuit if a definite yes from me. 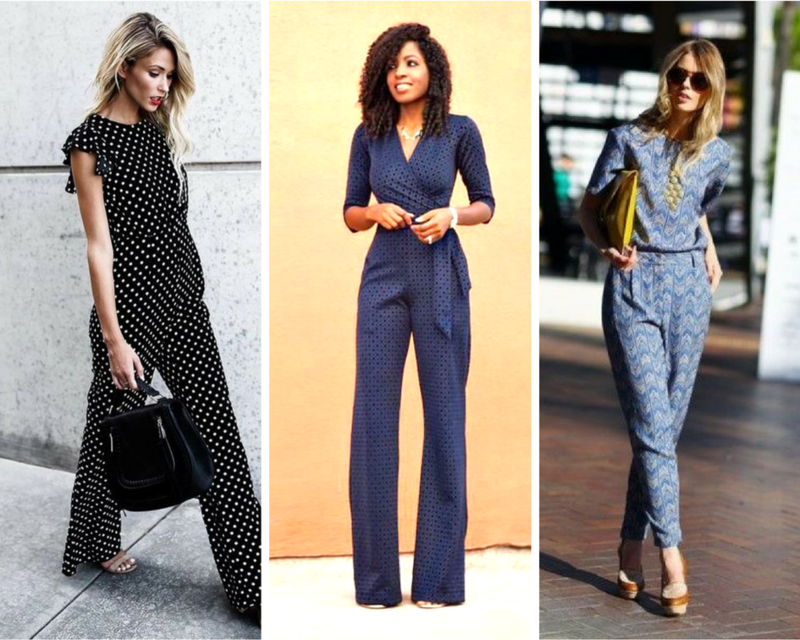 The trick with wearing a patterned jumpsuit to the office is to jeep the pattern small or dainty as opposed to bold or bright floral and still within the colour palette. The office environment is changing and fashion is moving on and is allowing for women to have more freedom with what they wear to work. A smart jumpsuit with a blazer is enough in a smart casual office and is also perfect for a business lunch. Plan your accessories well and you have the perfect day to evening look too. Topshop has some of the best Summer tops out there at the moment, they’re so versatile and can be worn dressed up or down. I love wearing a long sleeve top with short shorts (as you may know) or a cropped top with high waisted jeans or even white denim culottes and some flat sandals and a basket bag. Here’s to hoping that the sunshine stays where it is in London – high in the cloudless sky! I like to think that I take really good care of my skin after living my teens and early 20s not really paying much attention to it at all about it. Back then I’d just happily put on allllll the make-up and barely take it off! Nowadays my skincare routine is my self-care thing and I actually really enjoy it, I take my time with it, it feels indulgent and I can make my skincare routine as long or as short as I want to. 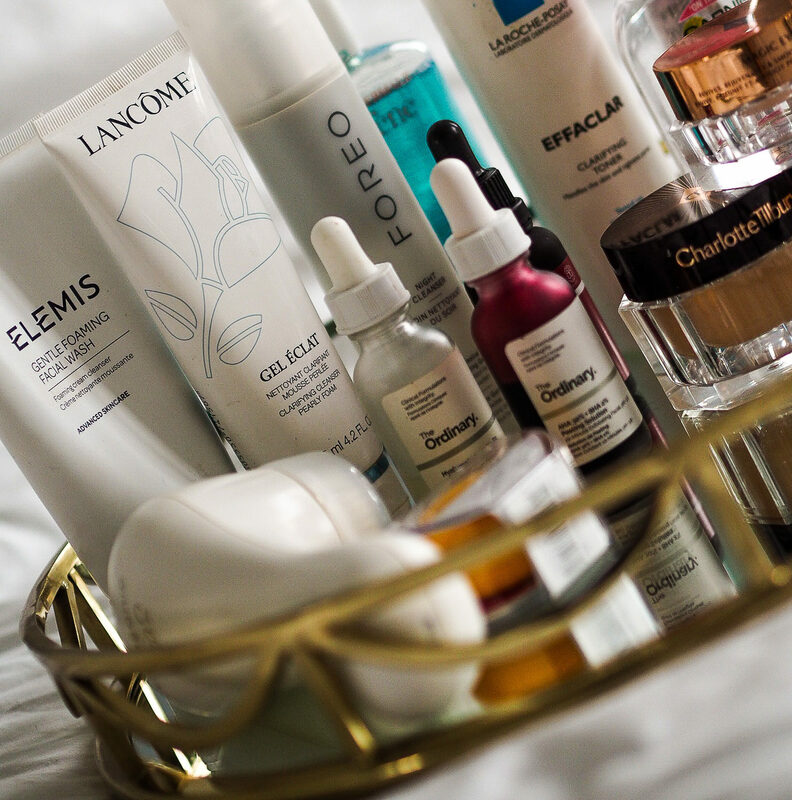 My routine changes depending on what my skin needs at that particular time, so I sometimes add products in or swap products for others. 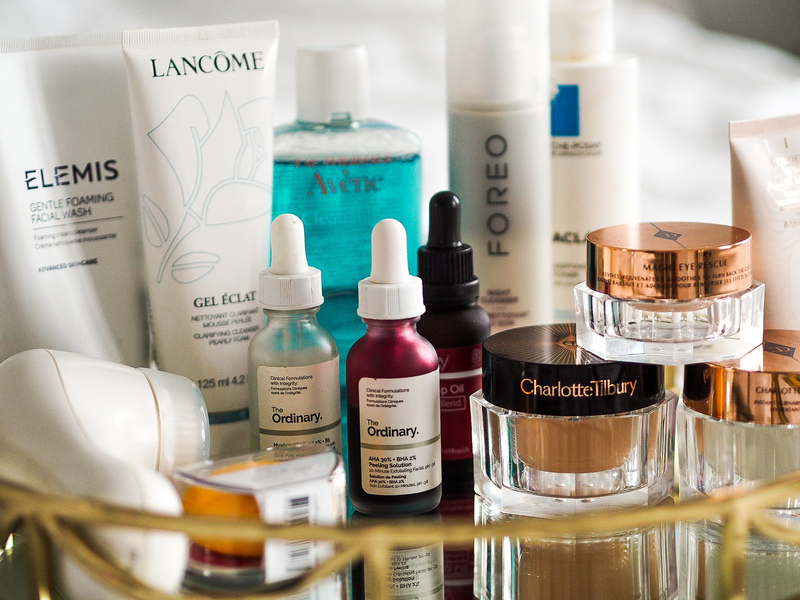 My Spring skincare routine adds in lighter products because the harsh Winter has gone and my make-up is lighter too, but that’s for another post. In Spring, I also need UV protection but more hydration because of the heat. Skintype: My skin is probably referred to as combination as I experience the odd hormonal break out now and then but can get dry in places. Elemis Gentle Cleanser £28.00 – which is a foaming cleanser which I prefer when my skin isn’t necessarily on the oily/blemish prone side this is a very gentle foaming cleanser and doesn’t leave my skin feeling stripped. This removes make-up really well. Garnier Micellar Water £1.99- I use Garnier Micellar Water for sensitive skin water in my Spring skincare routine twice a day. 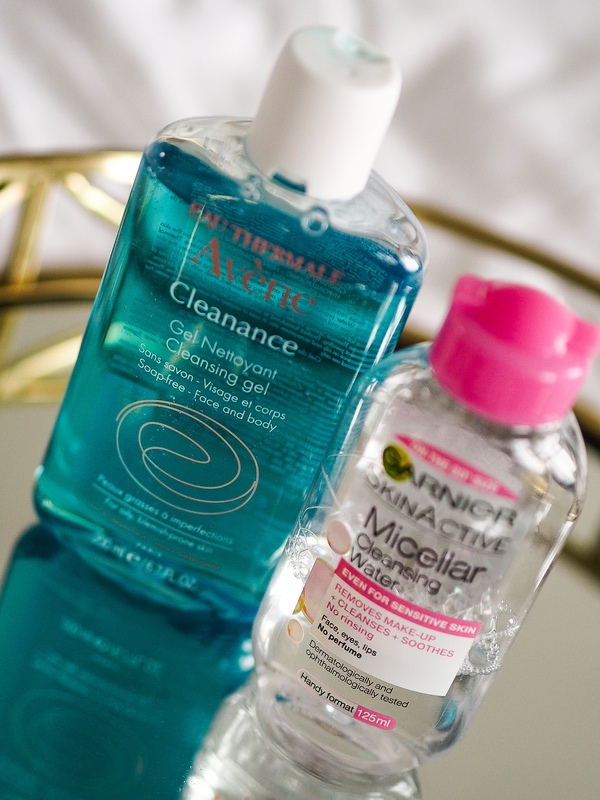 I like this one one as it’s one of the first micellar waters I’d heard of. I love that I can buy it anywhere (in with the weekly shop) but annoyingly, the bottle is usually 125ml which means it can’t go in carry-on. So I use other brands when I travel. 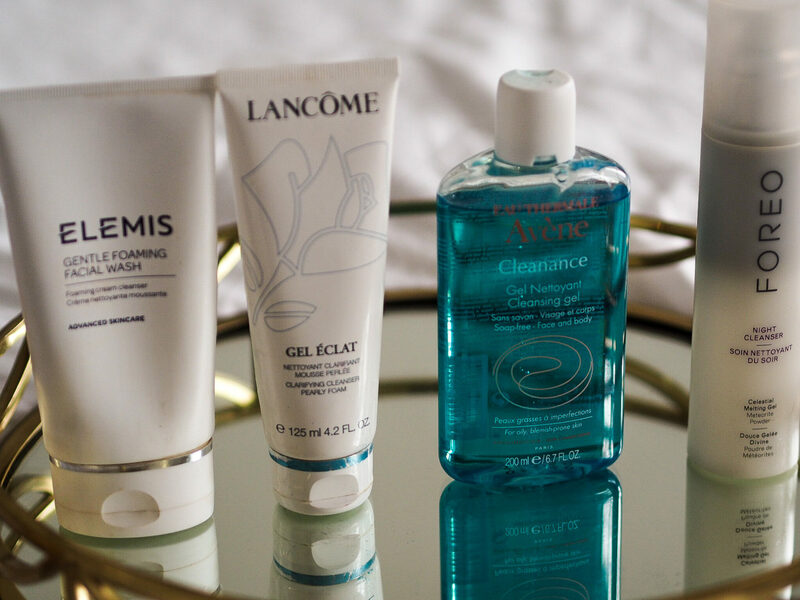 I use micellar water after I’ve used the Avene or Elemis foaming cleansers to remove any last bit of eye make-up and to remove actual cleanser residue from my jawline and hairline. La Roche-Posay Effaclar Toner – I pat this toner on my face with my hands and this helps mattefies my skin, balances PH levels and prevents breakouts. It’s really good and isn’t drying. The Ordinary Hyaluronic Acid 2% £5.90 – My skin has a tendency to be on the dehydrated side so in my Spring skincare routine, I like to keep it hydrated by using a hyaluronic acid under my moisturiser. It helps my skin look and feel plump. The prices of these products from The Ordinary are amazing plus they’re actually really effective – this product is about £5.90 direct from ASOS (be quick, because it sells out fast on there) or otherwise you can get it from Deciem directly or Amazon for about £11.00 on Prime (I have no idea what I’d do without Prime in my life). Charlotte Tilbury Magic Eye Rescue* £40.00 – This is one of my favourite eye creams, I like my skincare to feel like it’s actually doing something and this eye cream helps reduce puffiness, smoothes, refreshes, reduces dark circles, improves wrinkles and gives skin energy. I look forward to putting it on, I really like the consistency. 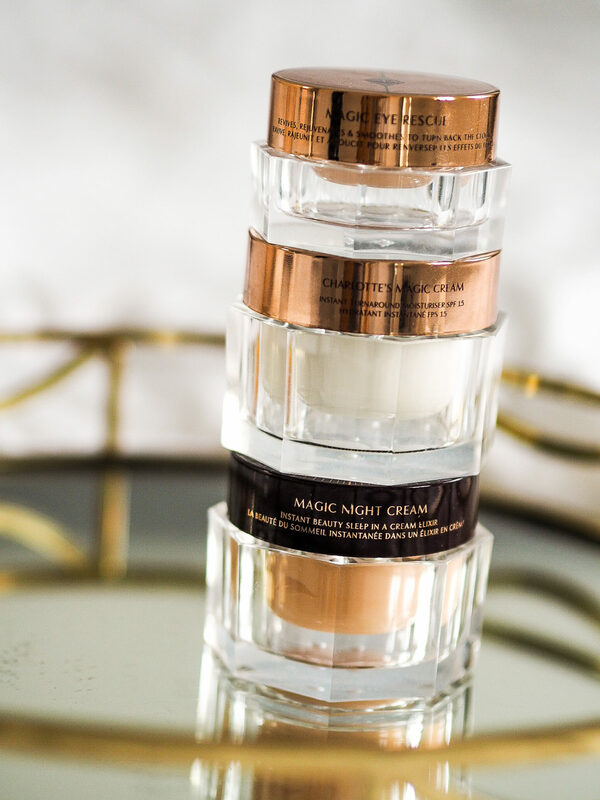 Charlotte Tilbury Magic Cream £70.00 – I have been using this moisturiser for at least a year and I think it’s such an effective moisturiser that really keeps my skin moisturised all day. It’s also not full of perfume which is really important to me. I love the smell of certain products but I’d much rather the smell comes from the ingredients than added perfume. This is a great all-round moisturiser regardless of your skin type it also has SPF 15 my skin looks dewy and plumped up after using this. La Roche-Posay Anthelios XL SPF 50 £16.50 – (not pictured) This is one of my favourite SPF products, its super light and is really good if you have skin that is sensitive to the sun or products in general. 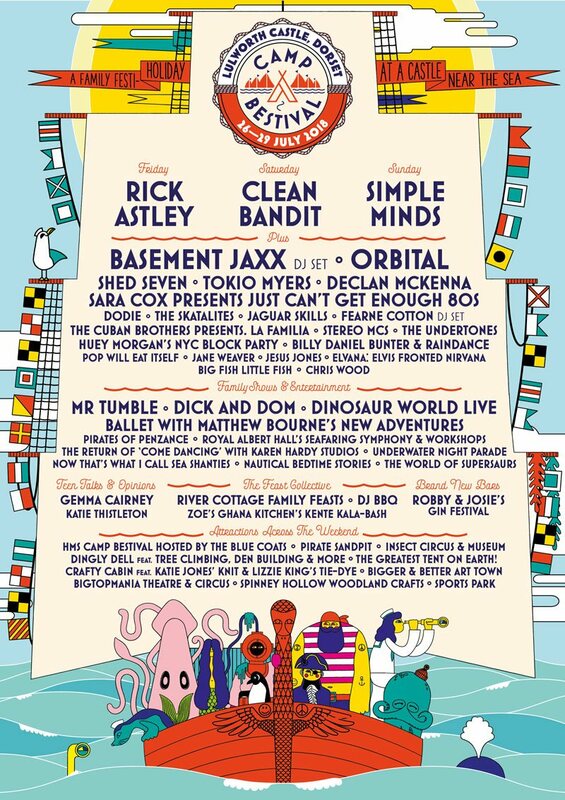 You definitely need a moisturiser over the top of this as (see below). Poppy and I both suffer with eczema occasionally which we manage well and we have found that La Roche-Posay products are particularly good for us. Foreo Night Cleanser – £30.00 this is an oil-based night cleanser melts from a gel into a milk. This cleanser removes impurities, makeup and pollutants for a clean and supple skin afterwards. It removes everything but the oil means your skin isn’t stripped. Clarisonic Cleansing Brush £130.00 or the Foreo Play Cleansing Brush £39.00 – I use either of these according to where I am. I don’t tend to travel with the Clarisonic as it’s quite bulky. 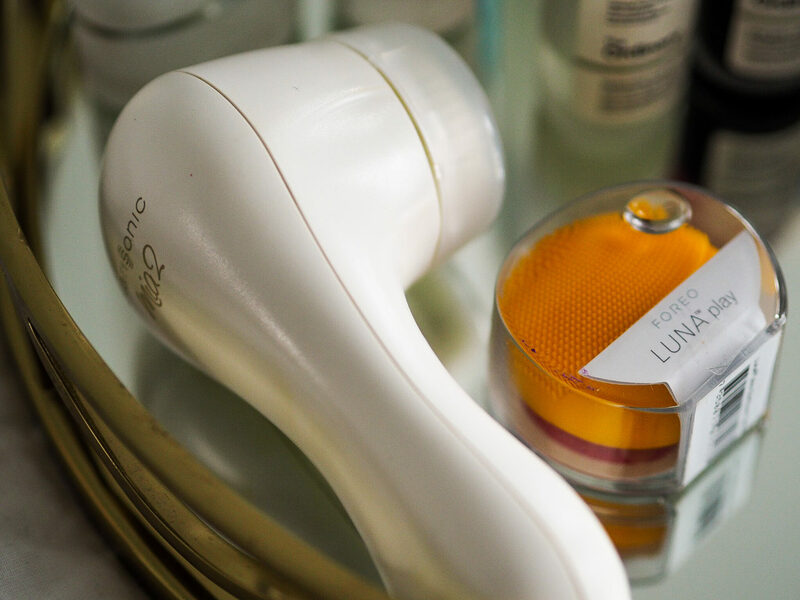 My Foreo Play is much more portable (it’s about the size of a golf ball). Using a face brush is so much more effective at cleansing your face than just using your hands. I will alternate using a brush and using an exfoliating product, I never both in the same day. Lancome Gel Eclat £23.00 – The Elemis Foaming Cleanser I’ve mentioned is really gentle. this one from Lancome is not necessarily ‘gentle’ but it is probably the best cleanser I’ve listed here. If you wear lots of make-up this will literally leave your face feeling squeaky clean. The Ordinary AHA 30% + BHA 2% Peeling Solution – This is one of my favourite exfoliators, it’s another sell-out product that removes the top layer of the skin to give brighter appearance, decalog pores and give skin a more even appearance. What’s not to love. — after exfoliating — The product you put on the skin after exfoliating really matters, your skin will really absorb the product, so at least once a week I use a sheet mask after exfoliating. Some of my favourites are the Charlotte Tilbury Instant Magic Facial Dry Sheet Mask £18.00 – helps my skin looks healthy, glowing and refreshed. If my skin is congested I’ll use Dr Jart Clear Skin Lover Rubber Mask – it really calms my skin down and gets rid of breakouts. 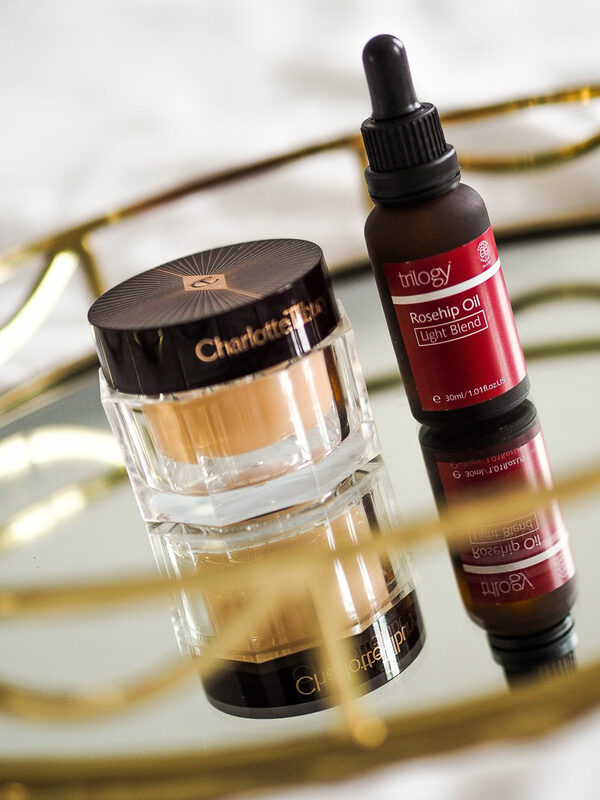 Charlotte Tilbury Magic Eye Rescue – Same as above, the Charlotte Tilbury Magic eye Rescue, I use a bit more at night so it can sink in. Charlotte Tilbury Magic Night Rescue – I rave about this on my Instagram Stories, I love the consistency as this is actually a balm. My skin feels really hydrated and firm in the morning. Because I put The Ordinary Retinoid on over the top this prevents my skin getting dry. 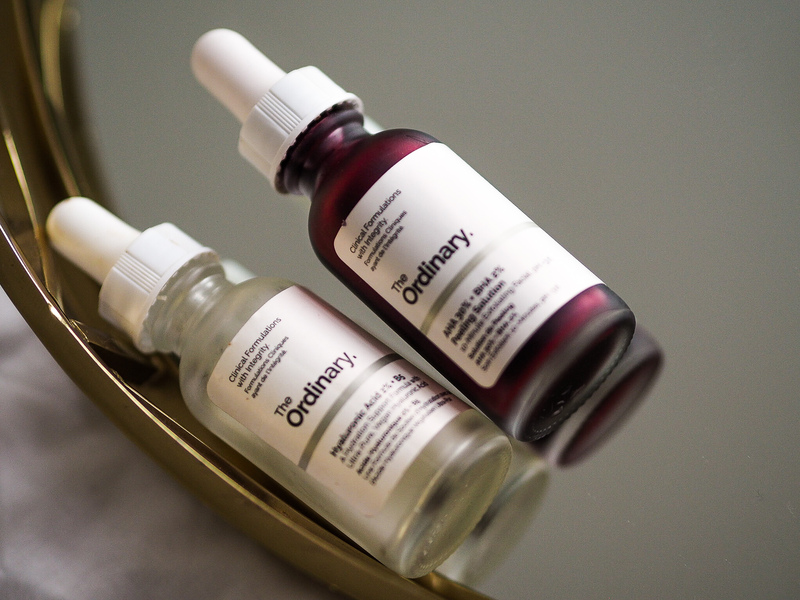 The Ordinary Granactive Retinoid 2% – (not pictured) Another great product from Deciem, adding a retinoid has duel effect for me. Retinoids are amazing for preventing ageing and they’re also great for blemishes and hormonal acne. Win:win. Trilogy Organic Rose Hip Oil – I alternate this with the Retinoid. Rose Hip Oil is loved by celebrities, models and Royals (David Gandy and Kate Middleton are both fans of Rose Hip Oil). It hydrates, plumps and firms skin. I have just started using the light blend* of this oil which is a swap of the original blend for Spring and I this one is great. Evens skin tone and prevents ageing, and it helps that it totally organic and natural – its a great treatment oil. As much as we’ve been moaning about the weather recently, I pray it will get warmer soon so you need to be prepared. As with managing eczema, some creams and emollients will work and others won’t, it’s a matter of trial and error. 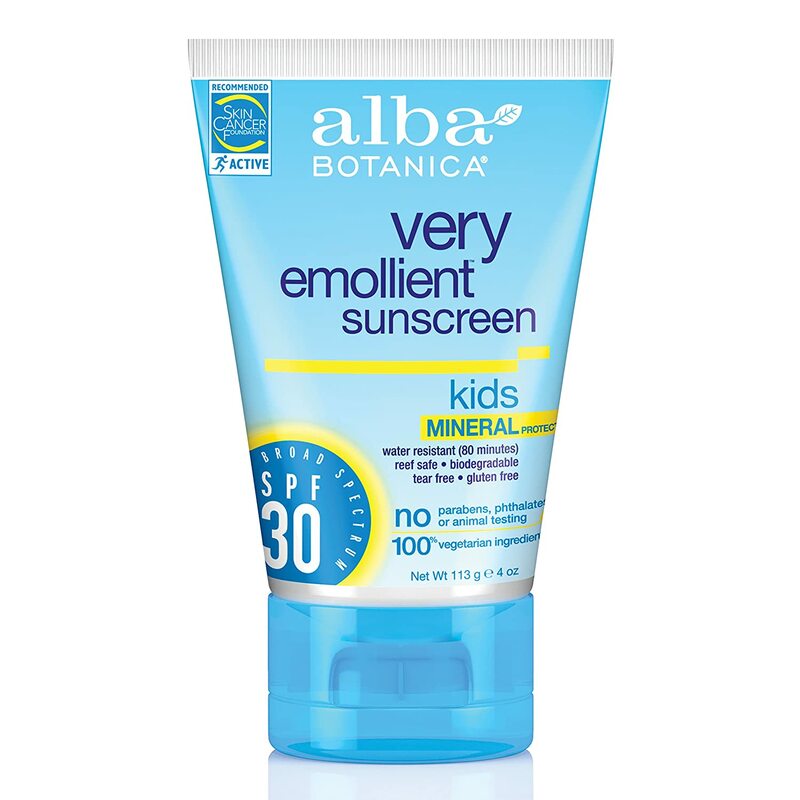 Many people with eczema find mineral-based sunscreens to be less irritating to their skin but this won’t be the case for everybody. Some people with eczema fair better with sensitive, fragrance-free sun scream instead. You need to find out what works for you and your child. You’re advised to test on a patch of skin 5-days before you go out in the sun or on holiday and see how the skin reacts. It could sting or irritate the skin and you don’t want to be stuck abroad without a suitable alternative. At the bottom of this post I’ve included some tips for managing eczema whilst in the warm weather or on holiday, that you should consider in addition to a suitable sunscreen for babies and children with eczema. 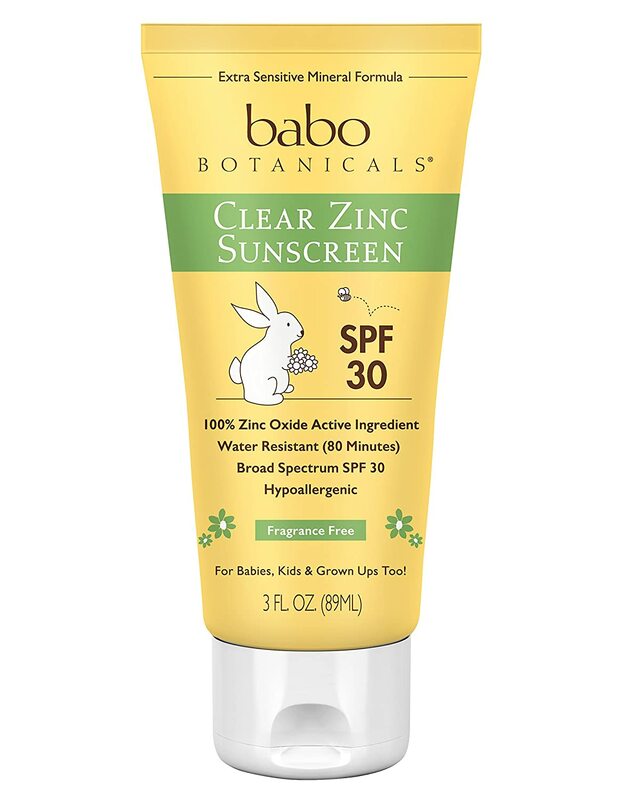 Here are a few sun creams I’ve found online that are fragrance-free, intended for sensitive or eczema prone skin or are mineral-based. From experience, I’ve found that some of these products aren’t available in stores, so my advice is to shop online. We have personally used this*, the one above is the baby formulation. 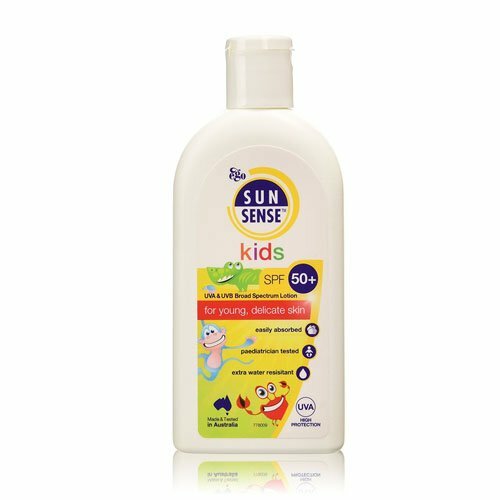 It’s slightly thicker than the kids version and goes on white as a guide as most baby sun care products do. This worked well for Poppy without irritation. We have also used this formulation, less thick than the baby formulation and is one of our favourites. Definitely needed 2 of these for a 10 day holiday last year. Children should wear a hat in the direct sunshine. Stay under a parasol when the sun is at its highest, i.e. between noon and 2pm when you should have lunch or take a siesta. Keep a gap between applying an emollient to moisturise the skin and applying the sun cream to avoid diluting the SPF. Gently apply the sun cream as over-rubbing may set off itching. Wear UV resistant swimwear, a rash guard that covers the arms is a good option. 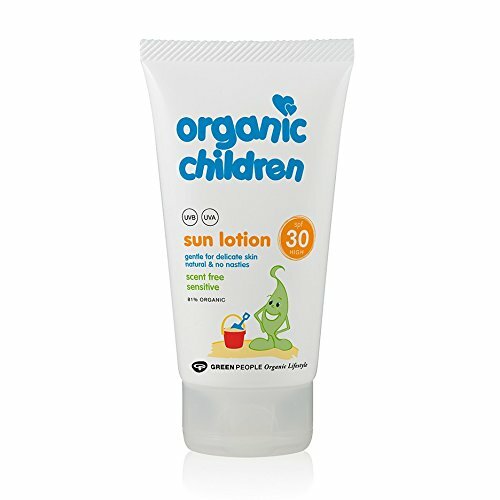 When choosing a sun cream for babies and children with eczema the advice is to look for ‘zinc oxide’ as the active ingredient on the label, or ‘titanium dioxide’ as a second choice. If you are using a chemical sun screen (as opposed to a mineral or mineral-based sun screen, spray in your hand before applying all over). Children and babies with eczema should have a bath or shower every evening and the skin should be cleansed with an appropriate cleansing product suitable for eczema prone skin to remote any product and dirt sitting on top of the skin. The usual emollient or natural, sensitive after-sun products like aloe vera can be applied before bed. 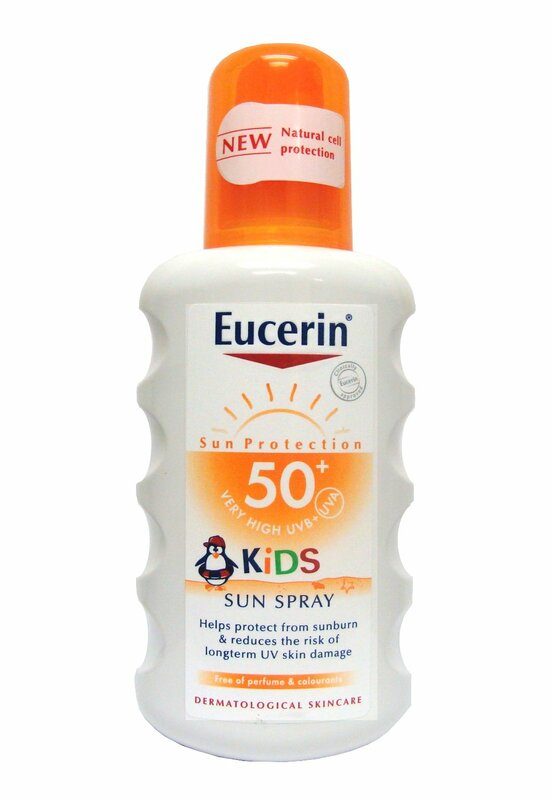 I will be adding more sun cream for babies and children with eczema as I find them. If you have any reviews of these creams, please do share. For more details about the National Eczema Society you can call them on 0800 089 1122, email helpline@eczema.org or visit www.eczema.org. The above post is not to be considered medical advice, and nor are you to use the information contained in this post instead of seeking medical advice from a qualified medical practitioner. Please contact your GP or the National Eczema Society if you have concerns regarding your skin or the effective management of eczema.